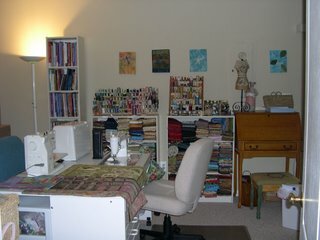 Here are a few images of my studio. In this picture, you can see some of my two bulletin boards. 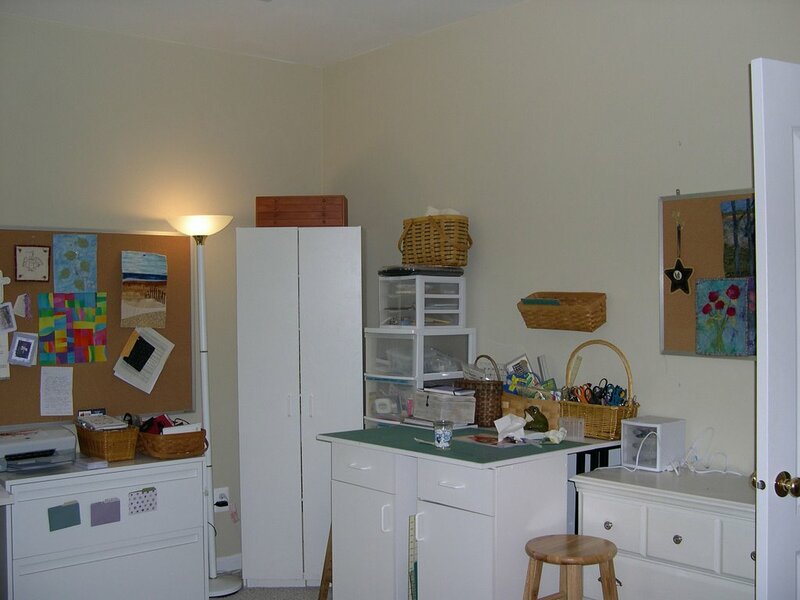 This is my cutting table and cabinets where I store all my paper crafts. I carved some stamps using corks. I will have to post pictures of that later. 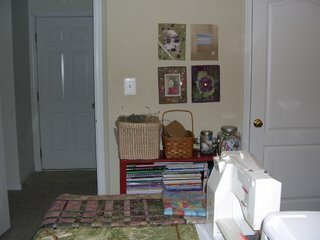 When I get the other end of the room unpacked, I will take pictures of that, too. This is a view of my studio when you walk in the door. 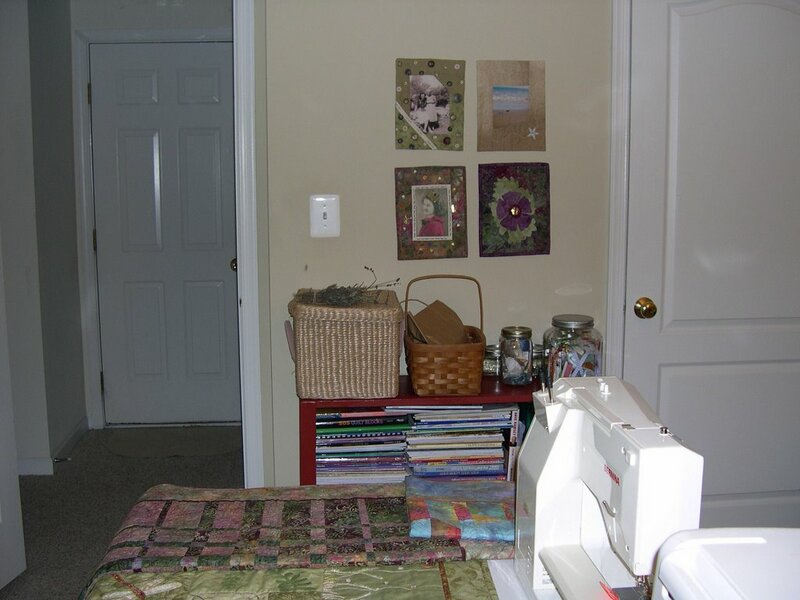 My sewing machines are ready to start stitching, but I haven't stitched a thing since the move. I need to get busy on that! 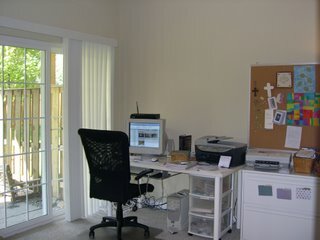 This is a view of my computer area in my studio. I need to hang some artwork over the computer and tidy up a few endless wires, but it has a nice view of the patio outside. It is nice to sit here with the door open and feel the breeze. 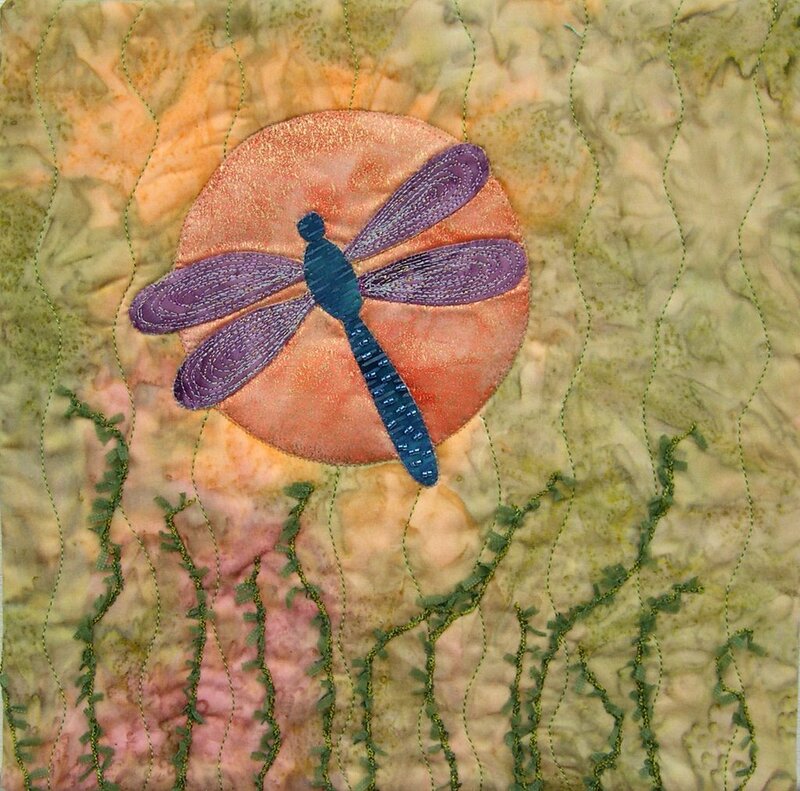 Here is a picture of my dragonfly quilt. 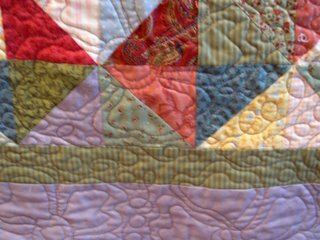 It is a little quiltlet 10" square. Working on a small quilt allows you to use different techniques and experiment. 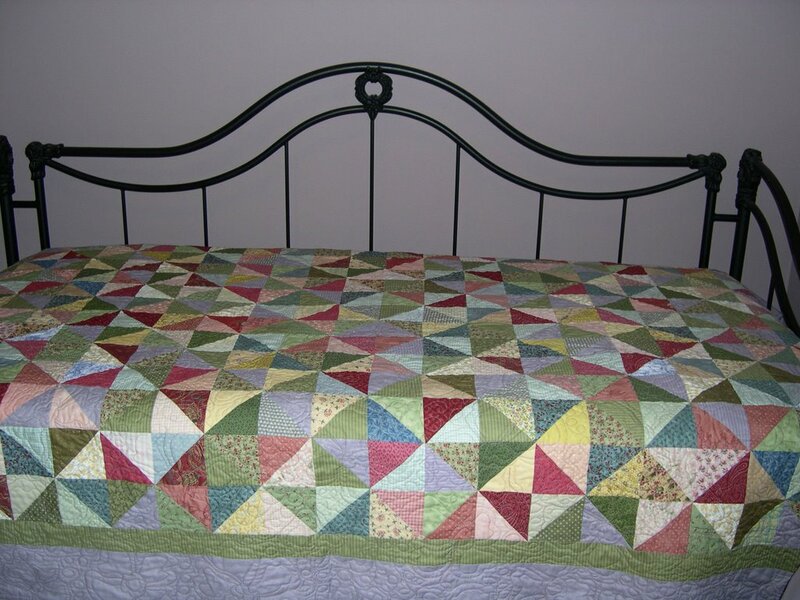 This one has been in a few shows and I think will retire itself to home. 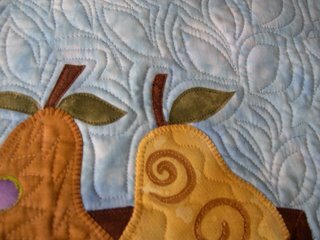 I couched the yarn for the vines using invisible thread and a zig zag stitch on the machine. 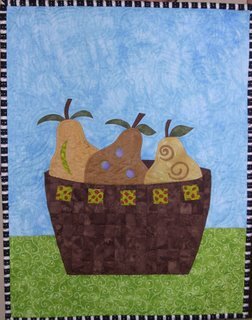 The background is a wonderful batik I bought at Patchwork Dreams. 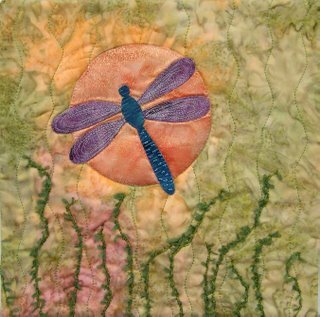 The dragonfly wings are fused Wonder Under and machine stitched. 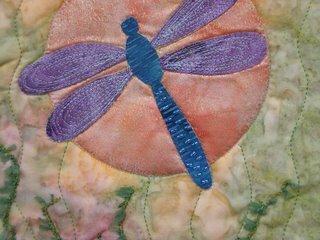 I beaded the dragonfly body. This is Betty Boop...the sweetest little Boston Terrier ever. Of course I would say that because she is my granddog. She is a sleepy girl in this picture but loves to pose when the camera comes out. It is time for us to find a pet. 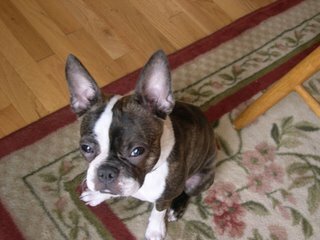 Of course, I want a Boston but my hubby says we can only get a cat(s). 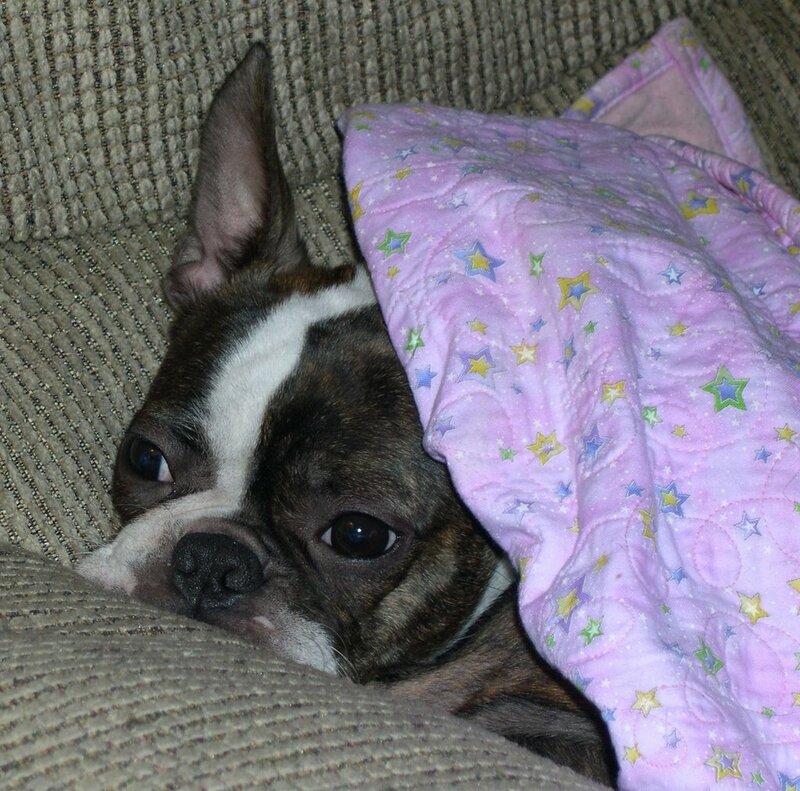 (I bet if he came home one day and found a Boston and a cat he would be thrilled). So the search is on for a cat. There are hundreds, maybe thousands to adopt from all sorts of agencies here in northern Virginia. You have to fill out a form and wait for them to approve you. As most of my family and friends know, a cat has a life of a prince or princess when we adopt them. Our home becomes their home and the cat allows us to stay there as it's servants which we lovingly do. 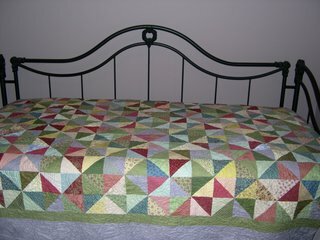 This is a pinwheel quilt I made to fit a daybed. 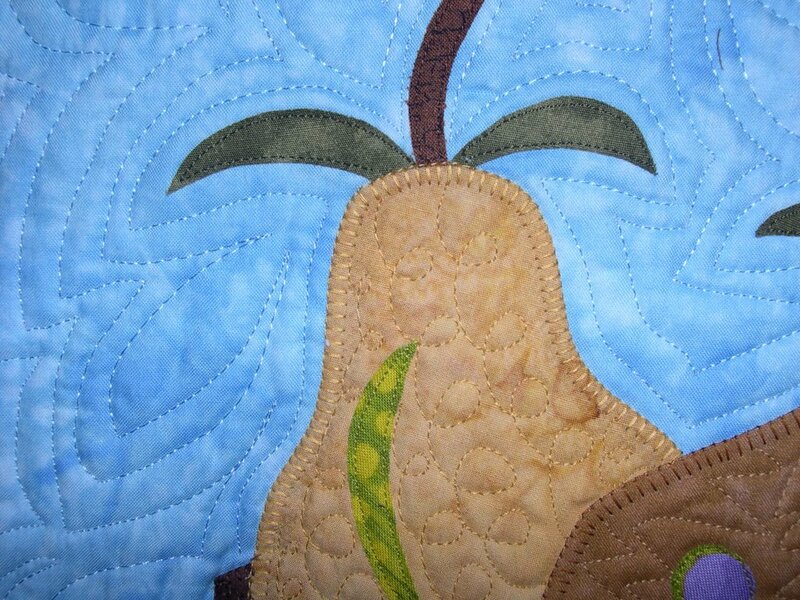 It is machine pieced and quilted on my Juki. Here is a detail of the free motion quilting. It is just random flowers and loops. Lots of fun to do. We just returned from Ohio...had a great weekend with family and friends. Virginia had lots of rain from hurricane Ernesto. It rained all night and most of the morning. It is so nice to have the windows open to smell and hear the rain. It is very intoxicating. 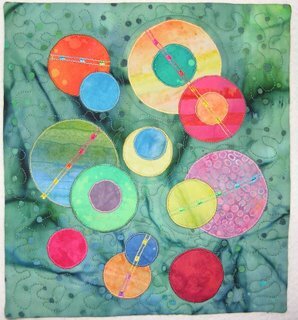 I just tried to post some pictures of one of the art quilts I made. I am having trouble with the position of the text so I will have to work on that. 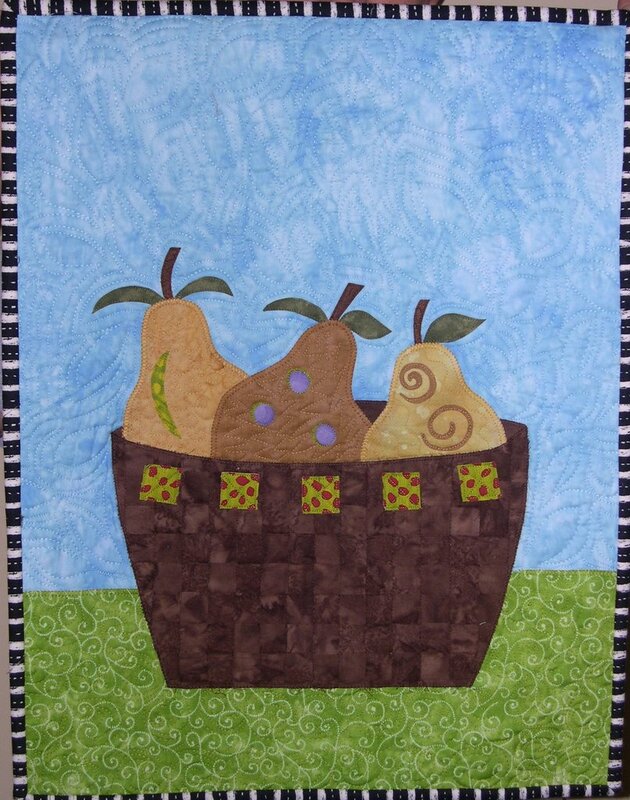 Blogger did not publish my edit of the post so maybe when I learn more, I will publish the edited version. So, excuse the text out of line with the pictures for the moment. 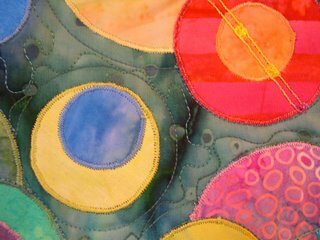 An art quilt ---"Almost Connected"
"Almost Connected" (sold) and a detail of the quilt...all done on the machine.